A walk around Lyme Park (with free parking tips). You know the place - it's where Mr Darcy swam in the lake. 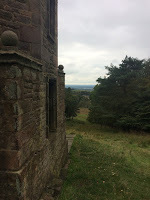 Lyme Park is about 25 minutes drive from me and a place I love spending time wandering around. I've been in the house and gardens a couple of times but not for ages now, yet the surrounding park is full of adventure from remote, mysterious buildings to wild moorland and woodlands. There are deer too, lots of them. The herd at Lyme Park descends from the original medieval herd and are fairly easy to spot if you know where. A good, short, walking route is freely available at site the National Trust's - as are plenty of other walks where you can see the annual rut each autumn. This is the one I followed and took me just under an hour, including the walk from my chosen parking spot where I picked up the walk at point 8 rather than the main car park. National Trust won't appreciate this but I find £8 just to parking unaffordable. If the whole family are going for a day then fair enough and I'm happy to pay for that but I like the odd walk and I ain't paying that each time. Yes, I know that I can take out membership but that is also expensive and to be honest, Lyme Park is the only place I go to regularly. Here's my legitimate freebie tip for other walkers - on Mudhurst Lane there's a large layby right next to an old track that leads to the East Lodge. The track is no longer used for access as the old bridge halfway along is dangerous and it's a lovely quite walk that can form part of a longer perimeter walk. Walking though the East gate you enter the park alongside the deer sanctuary and the herd are usually easy to spot here. Fine views past the cage to Manchester and the Cheshire plain too - it's odd seeing planes flying lower than you as they approach Manchester Airport. The walk takes you in a circular route past the old cottage gardens and up the edge of moorland into Lantern Wood with it's eponymous tower. Romantic but not much to see in the tower really, it's primary use is to be seen from the house and not the other way round. The walk brings you back down to the sanctuary. It's not a big walk out of your way to the Cage or the house, and there's a marvellous adventure playground for the kids too. whether I'm biased in my reviews if I've been given stuff for free. There are 2 things you need to know about this review of Prevenge. The first is that I don't know where it came from, it just turned up in the post with no covering letter. It's most likely a comp win but I remember entering a few comps for this so I'm not sure which one I won. The second potential point of bias is that I have a ridiculous crush on Alice Lowe that has lasted some 13 years since I first saw Garth Marenghi's Darkplace. This talented person wrote, directed and plays the lead in this film described as a 'comedy slasher' film. This isn't a dark comedy, it's darker than that. Ruth is in the latter stages of pregnancy and her unborn baby is talking to her. "Ah, sweet," I hear you say. No. This baby is urging Ruth to avenge the death of baby's dad who was killed in a rock climbing accident by tracking down the others involved and, well, you can guess why this is in the slasher genre. The greatest part of this film are the characters. Most are quite horrible with the exception of Ruth's midwife (played by Jo Hartley) who is just irritating and Mike Wozniak's Josh who is lovely. In the first scene we are introduced to Dan Skinner playing a pet shop owner who is creepy, slimy and by the end of the scene, late. You think he's a horrible character? Wait until you meet DJ Dan (Tom Davis) who is the most marvellously grotesque creation I've seen for a long time. His scenes are wonderful, viewed through fingers, and you can feel good about sheering his demise. Lowe herself is as you would expect - straight faced, casually delivering lines of comedic beauty and leaving the viewer unable to work out whether this is scripted or improvised. What isn't improvised is the pregnancy, Lowe herself being pregnant at the time of filming. I'd be a bit scared of Lowe if I met her, I think, if she creates stuff like this with a baby inside her. What if we end up reading some horrific story in the papers and we all realise she was trying to tell us something? There are negatives to the film. I found the plot confusing at times. I'm trying to avoid spoilers but there were several unanswered questions at the end and even some of the things I thought were clear and talked about to my wife ended with her saying "really, I thought that she did that because...." and we were way apart. My wife thought long and hard about the film and the next day told me that she didn't think she enjoyed it. For her, the comedy wasn't enough to outweigh the horror in the way it would in, say, the Cornetto Trilogy. For me, I enjoyed it more than that but not as much as the aforementioned Simon Pegg and Edgar Wright films. Bush at the Ritz O2, Manchester. A fellow blogger was given 2 tickets for this show and shared the wealth. 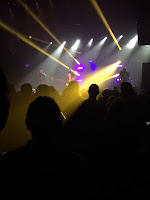 My first visit to the Ritz since seeing the Chameleons about 20 years ago although I was a regular at the student nights there in the mid-nineties. It didn't seem to have changed much - tiny lobby with box office then straight into the ballroom with a bar either side. The balcony was off limits for this gig which probably reflected the size of the crowd. Nice and compact it is - the bars are next to the floor so you miss nothing, there are no seats - we're all in it together. £5.40 for a pint of San Miguel kept the pre-show drinks to a minimum, mind. I like this venue - easy in, easy out and straight into the city. It was my first experience of Bush. Straight face. None of my friends are really into Bush and I was surprised how little I knew of the band. I reminded myself of their back catalogue on YouTube before the gig but only 'Swallowed' was familiar - their only UK top ten hit. Yet, this London band are HUGE over the pond and the reason is probably why few people over here have taken to them. Their style is very American and a pretty straight up Nirvana clone years after grunge first appeared. They also launched themselves in the mid-nineties at the height of Britpop so most Brit guitar music fans seemed to have let them pass by. This is also reflected in the crowd. The stadium selling band over there didn't sell out the Ritz over here and of those present I suspect many were on freebies too. The atmosphere was polite, intent and supportive but for a loud rock gig's opening salvo of chords not to be met with a bouncing mosh pit was telling. And yet by the end this crowd was pretty much won over. At one point the still buff Gavin Rossdale went walkabout in the crowd and while the going was relatively easy the camaraderie was genuine. Corey Britz kept the arms aloft and engaged with the crowd while Chris Traynor and robin Goodrige maintained the pace on lead and drums. Rossdale (did I mention his incredible figure - the man's 51!) bounced around with guitar, without guitar and stuck pretty much to working his way through 15 songs over 90 minutes. With each song more arms took to the air and there was a decent singalong to Swallowed and, during the encore, a cover of REM's 'The one I love'. My personal highlights was 'This is War' - tight, loud and heartfelt. The atmosphere got progressively rockier and I think a fair bit of respect was won from previously dismissive musos. Certainly the case for me. I can't let the gig pass without mentioning the support, Raveneye. These boys rocked. Blistering rock 'n' roll from a British three piece that really looked like they were enjoying themselves. Laughter, high jinks and a wall of joyful noise. I posted at the time that I've never seen a support act win a crowd over as quickly as Raveneye. I really wanted to point you in the direction of the live Facebook feed they broadcast but the sound is awful. Have some YouTube stuff instead. 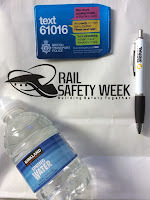 Rail safety week stuff - pen, ticket wallet and a bottle of water. I'm a daily rail commuter and have been for several decades. I'm sensible but maybe take my safety for granted. I definitely take the safety of others for granted - there a some harrowing statistics on the website for this. One death, even one accident, is one too many and anything that raises awareness of this is a good thing. Rail Safety Week is an industry led initiative but focuses on all those involved with railways from the rail maintainers to the operators to users like me. Please do take time to visit the site. Artistic ingenuity - WIN some!